Do not leave the key in your vehicle with children and keep them in a place where your children will not fi nd or play with them: Leaving children in a vehicle with the key is dangerous. This could result in someone being badly injured or even killed. Children may fi nd these keys to be an interesting toy to play with and could cause the power windows or other controls to operate, or even make the vehicle move. The key is carried with communication devices such as cellular phones. The key contacts or is covered by a metal object. The key is near electronic devices such as personal computers. Non-Mazda genuine electronic equipment is installed in the vehicle. There is equipment which discharges radio waves near the vehicle. The key (transmitter) may consume battery power excessively if it receives high-intensity radio waves. Do not place the key near electronic devices such as televisions or personal computers. Expose the key to high temperatures on places such as the instrument panel or bonnet, under direct sunlight. Expose the key to any kind of magnetic fi eld. Place heavy objects on the key. Put the key in an ultrasonic cleaner. Put any magnetized objects close to the key. A code number is stamped on the plate attached to the key set; detach this plate and store it in a safe place (not in the vehicle) for use if you need to make a replacement key (auxiliary key). Also write down the code number and keep it in a separate safe and convenient place, but not in the vehicle. If your key (auxiliary key) is lost, consult your Authorised Mazda Repairer and have your code number ready. The driver must carry the key to ensure the system functions properly. Always keep a spare key in case one is lost. If a key is lost, consult an Authorised Mazda Repairer as soon as possible. 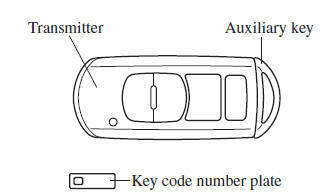 To use the auxiliary key, press the knob and pull out the key (transmitter). This system uses the key buttons to remotely lock and unlock the doors and the liftgate/boot lid, and opens the boot lid. The system can start the engine without having to take the key out of your purse or pocket. Operating the theft-deterrent system is also possible on theft-deterrent systemequipped vehicles. Press the buttons slowly and carefully. System malfunctions or warnings are indicated by the following warning lights or beeps. KEY Warning Light (Red) Refer to Warning/Indicator Lights on page 4-37 . Ignition Not Switched Off (STOP) Warning Beep Refer to Ignition Not Switched Off (STOP) Warning Beep on page 7-46 . Key Removed from Vehicle Warning Beep Refer to Key Removed from Vehicle Warning Beep on page 7-46 . If you have a problem with the key, consult an expert repairer, we recommend an Authorised Mazda Repairer. If your key is lost or stolen, consult an Authorised Mazda Repairer as soon as possible for a replacement and to make the lost or stolen key inoperative. Changes or modifi cations not expressly approved by the party responsible for compliance could void the user's authority to operate the equipment. The keyless entry system operation may vary due to local conditions. The keyless entry system is fully operational (door/liftgate/boot lid lock/unlock) when the push button start is switched off. The system does not operate if the push button start is switched to any position other than off. If the key does not operate when pressing a button or the operational range becomes too small, the battery may be dead. To install a new battery, refer to Key Battery Replacement (page 6-41 ). Battery life is about one year. Replace the battery with a new one if the KEY indicator light (green) fl ashes in the instrument cluster. Replacing the battery about once a year is recommended because the KEY warning light/indicator light may not illuminate or fl ash depending on the rate of battery depletion. Additional keys can be obtained at an Authorised Mazda Repairer. Up to 6 keys can be used with the keyless functions per vehicle. Bring all keys to an Authorised Mazda Repairer when additional keys are required. 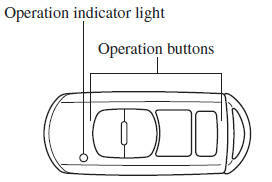 (European models) The headlights turn on/off by operating the transmitter. Refer to Leaving Home Light System on page 4-64 . (With theft-deterrent system) The hazard warning lights fl ash when the theft-deterrent system is armed or turned off. Refer to Theft-Deterrent System on page 3-44 . 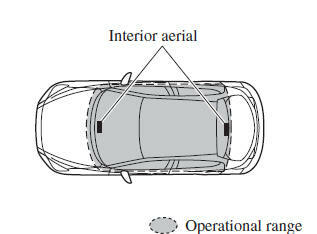 The setting can be changed so that a beep sound is heard for confi rmation when the doors and liftgate/boot lid are locked/unlocked using the key. (With the advanced keyless function (Except European models)) A beep sound can be heard for confi rmation when the doors and liftgate/boot lid are locked/unlocked using the key. If you prefer, the beep sound can be turned off. The volume of the beep sound can also be changed. Refer to Personalisation Features on page 9-13 . Use the following procedure to change the setting. Switch the ignition off and close all of the doors and the liftgate/ boot lid. Within 30 seconds of opening the driver's door, press and hold the LOCK button on the key for 5 seconds or longer. Switching the ignition to ACC or ON. Not operating the key for 10 seconds. Pressing any button except the LOCK button on the key. The operation indicator light fl ashes when the buttons are pressed. To lock the doors and the liftgate/boot lid, press the lock button and the hazard warning lights will fl ash once. (With the advanced keyless function (Except European models)) A beep sound will be heard once. The doors and the liftgate/boot lid cannot be locked by pressing the lock button while any other door is open. The hazard warning lights will also not fl ash. (Except European models) The doors and the liftgate/boot lid cannot be locked by pressing the lock button while any other door or the liftgate is open. The hazard warning lights will also not fl ash. Removing the key from the vehicle, closing all the doors and pressing the LOCK button on the key while the i-stop function is operating (engine is stopped) will switch the push button start OFF and lock all the doors (Steering wheel also locks). Refer to i-stop on page 4-12 . Make sure all doors and the liftgate/ boot lid are locked after pressing the button. Pressing the lock button twice within 3 seconds will activate the double locking system. Refer to Double Locking System on page 3-12 . When the doors are locked by pressing the lock button on the key while the theft-deterrent system is armed, the hazard warning lights will fl ash once to indicate that the system is armed. To unlock the doors and the liftgate/boot lid, press the unlock button and the hazard warning lights will fl ash twice. (With the advanced keyless function Except European models) A beep sound will be heard twice. After unlocking with the key, all doors and the liftgate/boot lid will automatically lock if any of the following operations are not performed within about 30 seconds. If your vehicle has a theft-deterrent system, the hazard warning lights will fl ash for confi rmation. The time required for the doors to lock automatically can be changed. 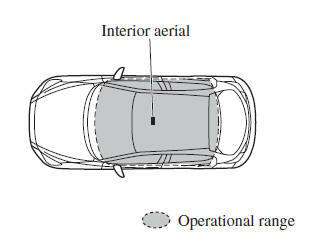 A door or the liftgate/boot lid is opened. The push button start is switched to any position other than off. (With theft-deterrent system) When the doors are unlocked by pressing the unlock button on the key while the theft-deterrent system is turned off, the hazard warning lights will fl ash twice to indicate that the system is turned off. 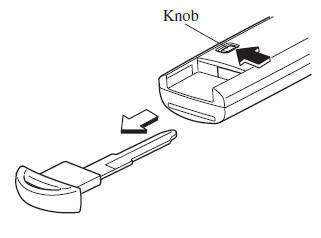 To open the boot lid, press and hold the boot button until the boot lid opens. To cancel the intrusion sensor (part of the theft-deterrent system), press the intrusion sensor cancel button within 20 seconds after pressing the lock button and the hazard warning lights will fl ash three times. Starting the engine may be possible even if the key is outside of the vehicle and extremely close to a door and window, however, always start the engine from the driver's seat. If the vehicle is started and the key is not in the vehicle, the vehicle will not restart after it is shut off and the push button start is switched to off. The luggage compartment/boot is out of the assured operational range, however, if the key (transmitter) is operable the engine will start. If a key is left in the vehicle, the functions of the key left in the vehicle are temporarily suspended to prevent theft of the vehicle. To restore the functions, press the unlock button on the functions-suspended key in the vehicle.